This brilliant wine has unfortunately been associated with Germany’s mass exports of the 1970s and 1980s, or more recently with brands like Barefoot, and is typically assumed to be sweet. But while Riesling can make some of the world’s greatest sweet wines, there is much more to this high-quality, age-worthy grape variety than meets the eye. It’s unclear as to where Riesling was first born, but most believe that it hails from Germany in the regions near the Rhine River. The grape was documented as early as the 1400s, and as producers moved their vines up steep slopes into poor soils over time, Riesling boomed. Though it was one of the most lauded white wine grapes in the mid-1800s, factors both commercial and political forced it out of the spotlight until the latter part of the 20th century. Today, Riesling is Germany’s most planted white grape variety, and it is found in most of the world’s top wine-producing countries, though it is much more prevalent in some than others. Plantings center in German-speaking, Old World regions like Germany, Austria, and France’s Alsace, but plenty of New World regions are having success with the grape as well – the Finger Lakes region in New York has adopted the grape as its prized varietal. It’s difficult to pinpoint a single, classic style of Riesling because it is such a chameleon depending on where it is grown. That’s what makes it so great; there a style of Riesling for every palate. One characteristic uniting all Riesling is the grape’s super high acidity. Beyond that, Riesling can be light or full, dry or sweet, delicate or powerful. Spatlese: Means “late harvest”. Fully ripe grapes bring more fruit intensity and a fuller body. 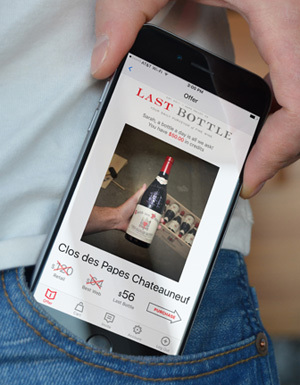 Spatlese wine can be dry, or off-dry and the subtle sweetness is often offset by the sharp acidity. Auslese: Means “select harvest”. Made in the best years from carefully chosen, fully ripe grapes. These wines are lush and fairly sweet. Beerenauslese: Literally translated means “berry selected harvest”, this wine is made from very ripe hand-harvested grapes affected by noble rot, and only in great vintages. Very sweet. Trockenbeerenauslese: The richest, sweetest, most expensive of all German wines. Only made in exceptional years. Eiswein: Literally “ice wine” and made from frozen grapes. They are crushed, and the ice separated from the juice, resulting in a very sweet, highly acidic dessert wine. 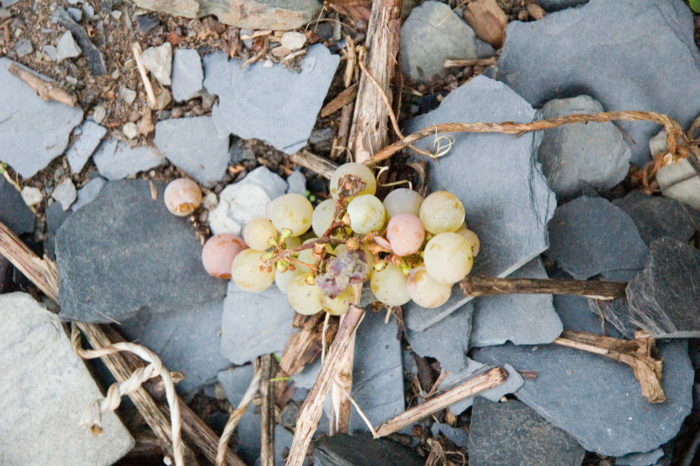 An early-ripening grape, Riesling does better in cool climates with poor, well-drained soils like slate. In fact, when Riesling is grown in an area that is too warm, it can easily become overripe and flabby. Very aromatic, Riesling typically smells of ripe or tart peach and citrus, depending on the climate, with distinct minerality that often comes across as smoke, slate, black rock, or petrol. Good Riesling has great aging potential thanks to the high acidity and sugar content. Over a decade or more they can transform into entirely new and dramatically complex wines, developing all kinds of secondary notes like honey, ginger, wax, nuts, and even mushrooms. Next time you buy a few, make a point to forget one or two in your stash. Occasionally you might find a strangely familiar odor in Riesling. A distinct petrol/gasoline type aroma is one of the defining characteristics of the wine and is more common in aged riesling, this comes from trimethyldihydronaphthalene or TDN for short. If the wine has high acidity, levels of TDN are more likely to increase over time. Also interesting – corks absorb much of the TDN, so a screw cap riesling will show much more of this trait. Germany continues to have the most Riesling vines, as it is grown throughout most of the country’s 13 regions. The central areas of Mosel, Pfalz, Rheingau, and Rheinhessen produce Riesling in both dry and sweet styles, often fine and delicate. Overall, German Riesling tends to be low alcohol (8-9%), quite fruity, with brain tingling acidity and touch of sweetness. Sunny Alsace, once part of Germany, lies along the French border with Germany and Switzerland and produces both dry and sweet styles, though Alsatian Rieslings tend to have a broader mouthfeel to them. Compared to their German counterparts, Alsace Riesling tends to be drier, more minerally, and aligned closer with the citrus spectrum of fruit flavors. 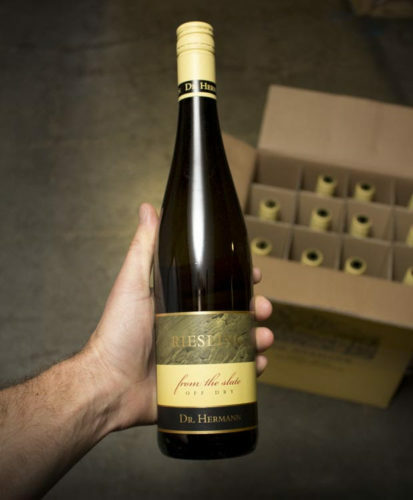 This Dr Hermann Riesling From the Slate 2012 we offered is a lightly sweet Riesling of lip-smacking deliciousness, with pure, clean aromas and flavors of tart pineapple, crushed rocks, honeysuckle, white flowers and lemons. Austria is another top Riesling-producing country, particularly in the neighboring regions of Wachau, Kamptal, and Kremstal, where Rieslings are usually dry and range from light to full. In a counter-intuitive fashion, Australia’s Rieslings are some of the driest around, with enamel-shattering acidity. These come from areas like Clare Valley and Eden Valley, as well as Western Australia areas like Margaret River. In the U.S., Riesling is grown in most major winemaking states, but it has greatest success in Washington and New York’s Finger Lakes region is especially famous for their examples. Around the turn of the 21st century, some 200 or so producers gathered to discuss a better way to classify Riesling. They coined the term “VDP” which stands for “verband deutscher Pradikatsweingter” – and created a stylized symbol of an eagle and grapes that adorns member’s bottles. They reasoned that with climate change affecting the growing conditions, all of the top vineyards can now achieve full ripeness levels each year, and the aforementioned sweetness terms (kabinett, spatlese, etc) only appear if there’s some sweetness in the wine. Otherwise it’s assumed to be dry (trocken). 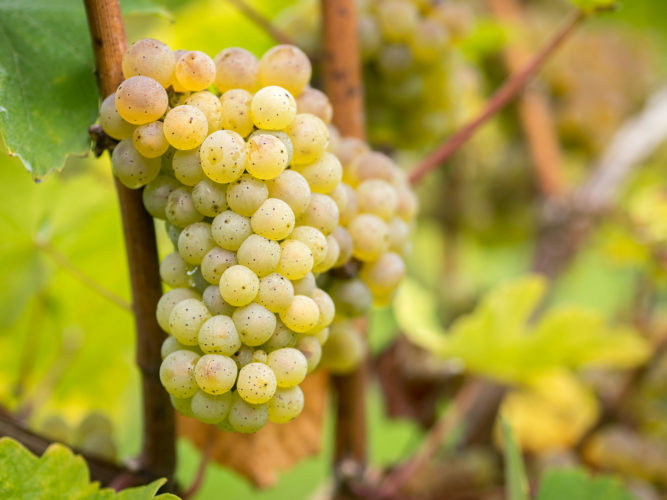 The naturally high acidity in Riesling makes it one of the most versatile white wines around, able to pair with dishes light and rich, tart and sweet alike. Different styles of Riesling pair with different kinds of food, and it would be quite easy to devise a five course meal to match five different wines. Drier styles pair well with fresh fish or salty, fried food, as the acidity easily cuts through the food, while sweeter styles fit well with fruit-based desserts. Off-dry Rieslings provide a nice partner for intensely spicy food as well. The list of top Riesling producers could go on for pages. In addition to these five, look for bottles from Joh. Jos. Prüm, Robert Weil, Dönhoff, Knoll, Nigl, Domaine Ostertag, Alkoomi, Jim Barry, and Dr. Konstantin Frank. We import incredible Riesling from the world's best regions (Alsace, Mosel, etc) and offer it direct to you at the best prices you'll ever see! We'll never spam you. Unsubscribe anytime!